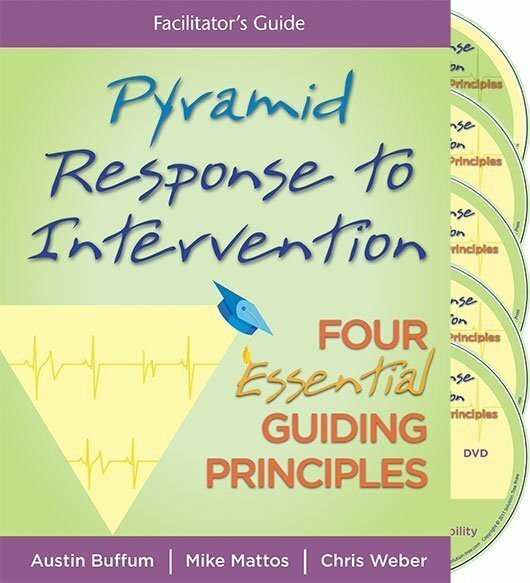 The sequel to Pyramid Response to Intervention advocates that a successful RTI model begins by asking the right questions to create a fundamentally effective learning environment for every student. RTI is not a series of implementation steps, but rather a way of thinking. Understand why bureaucratic, paperwork-heavy, compliance-oriented, test-score-driven approaches fail. Then learn how to create a focused RTI model that works. Use the four guiding principles to guide thinking and implementation. Shift to a culture of collective responsibility, and build team structures for collaboration. Define essential learnings in a program of concentrated instruction. Develop a system of convergent assessment to identify students for intervention, determine their unique needs, monitor their progress, and revise or extend learning based on their progress. Gone are the days when hard work and elbow grease were enough for the average person to make a living. To prepare for successful adult life in a competitive global marketplace, today’s students must learn more than the three Rs; they must also master the higher-level thinking skills required to continue to learn beyond high school. Those who do will find numerous paths to success. In stark contrast, many students who fail in school will go on to adult lives characterized by poverty, welfare, and incarceration, as we saw in the preface. With such high stakes, today’s educators are like tightrope walkers without a safety net—responsible for meeting the needs of every child, with very little room for error. We know one thing for certain: we are never going to get there doing what we have always done. Our traditional school system was created in a time when the typical educator worked in a one-room schoolhouse and served as the only teacher for an entire town. Today it is virtually impossible for a single teacher to possess all the skills and knowledge necessary to meet the unique needs of every child in the classroom. But even the one-room schoolteacher was not expected to achieve that outcome, as throughout most of the 20th century fewer than 20 percent of all jobs required even a high school diploma (Hagenbaugh, 2002). Our current reality dictates that every student succeeds in school, and so we must face the facts: our current system has never produced these results—not in the past, not now—nor will it in the future. Compelling evidence shows that response to intervention can successfully engage a school’s staff in a collective process to provide every child with the additional time and support needed to learn at high levels (Burns, Appleton, & Stehouwer, 2005). In the RTI process, schools do not delay in providing help for struggling students until they fall far enough behind to qualify for special education, but instead provide targeted and systematic interventions to all students as soon as they demonstrate need. Hundreds of schools are effectively implementing RTI practices to achieve record levels of learning for their students. Yet in spite of this knowledge, most schools continue to struggle to meet the needs of all their students, especially the ones most at risk. Most schools continue to function like one-room schoolhouses, with individual teachers responsible only for “their” kids. Some schools mistakenly view RTI as merely a new way to qualify at-risk students for special education and focus on trying a few token general education interventions before referring struggling students for traditional special education testing and placement. Others implement RTI from a compliance perspective, doing just enough to meet mandates and stay legal. For still others, RTI efforts are driven by a desire to raise test scores, which often leads to practices that are counterproductive to the guiding principles of RTI. Finally, some schools defiantly refuse to take responsibility for student learning, instead opting to blame the kids, parents, lack of funding, or society in general for their students’ failures. Far too many schools find the cultural beliefs and essential practices of RTI such a radical departure from how they have traditionally functioned that they are uncomfortable or unwilling to commit to the level of change necessary to succeed. 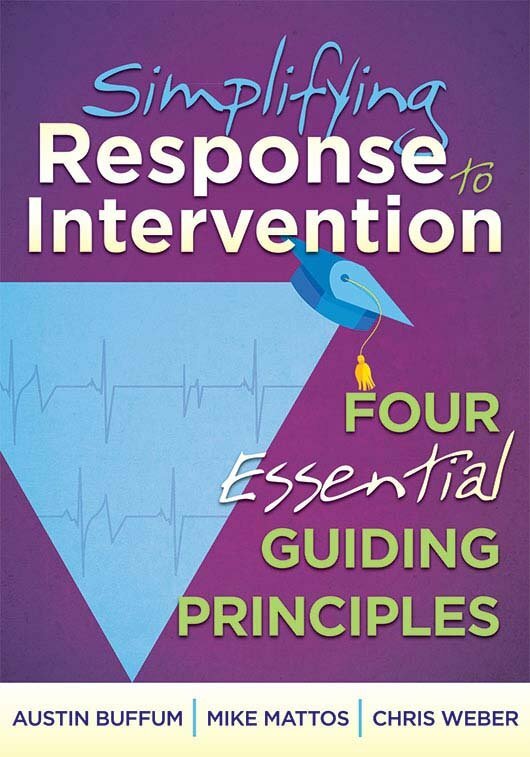 While the specific obstacles vary, the underlying cause of the problem is the same: too many schools have failed to develop the correct thinking about response to intervention. To fully realize the benefits of RTI for our students, we must develop a new way of thinking about how schools should work and redefine our responsibilities as educators. This new way of thinking is critical for two reasons. First, we observe too many schools that take proven research-based practices and misapply them due to misguided principles and priorities—they implement some of the right practices, but for all the wrong reasons. For example, a well-known characteristic of RTI is its emphasis on fidelity when implementing research-based instructional practices. To this end, districts often purchase a research-based core language arts program and then, in the name of “program fidelity,” dictate that this program constitutes the only instructional materials that district teachers can use. The quest for fidelity then becomes so rigid that each teacher is required to be on the same lesson, on the same day, following the same script. While we agree that scientifically research-based resources should be implemented within the proven protocols of the program, we also know that not all kids learn the same way. 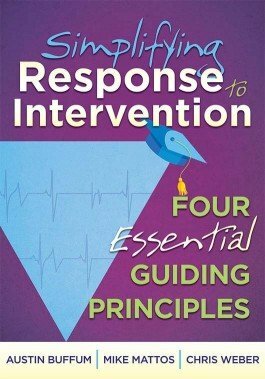 Second, no matter how many practical examples and proven interventions we provide in this book, there is no way we could possibly list examples of every intervention a school will need to meet the unique needs of every at-risk student. New ways of thinking about RTI will empower schools to adapt research and proven practices to meet the individual needs of their students using the distinct talents and resources of their sites. We want you to become like a master jazz musician: able to play the correct RTI melody, but also able to improvise and, ultimately, create your own music. How do we develop a new way of thinking? We must start by asking the right questions. The right questions shape organizational thinking and lead to answers and actions that improve learning for all students. Unfortunately, we find that far too many schools are asking the wrong questions. How Do We Raise Our Test Scores? This is the most pervasive misguided (and misguiding) question. While high-stakes testing is an undeniable reality in public education, this fatally flawed initial question leads to the wrong answers for achieving deep levels of student learning. We are constantly confronted with situations in which district leadership gives lip service to RTI while reinforcing the need for schools to “get the scores up now, or else.” As a result, schools often seek out the quick fix that will result in a sudden bump in test scores rather than investing in the long-term work. Many districts that focus first on raising test scores have concluded that strictly enforced pacing guides for each course of study are needed to ensure that all required state standards are taught prior to the high-stakes state tests. Usually, these guides determine exactly how many days each teacher has to teach a specific standard. Such thinking makes sense if the goal is to teach all the material prior to the state assessments, but not if the goal is to have all students learn essential standards. As educators, we know that students don’t learn at the same speed, so when arbitrary, predetermined amounts of time are allocated to achieve specific learning outcomes, students who need additional time to learn the concept will be left in the wake as the teacher races to cover all the material. This faulty thinking also leads to misguided intervention decisions, such as focusing school resources primarily on the “bubble kids”—those who are slightly below proficient. This policy is based on the conclusion that if the bubble students can improve a little, the school’s aggregated proficiency levels will likely make a substantial short-term jump. Consequently, the students far below proficiency often receive less help. If the primary goal of the school is to raise test scores, the bubble-kid approach, although morally bankrupt, makes some sense because the lowest-achieving learners are so far behind that providing them intensive resources will likely not show immediate gains in the school’s state assessment scores. But if the goal is to help all students learn at high levels, this approach will do nothing for the students most in need. These examples demonstrate thinking and practices that are contradictory to the underlying principles of RTI and the values of a learning-focused school. This is not to suggest that RTI will not raise test scores—on the contrary. When schools focus on all students learning at higher levels, improvement in standardized assessments will occur. How Do We Implement RTI? We often work with schools that view RTI as a mandated program that must be “implemented.” District leadership creates implementation checklists, protocols, and timelines and tells school staff what they must do to “implement RTI.” Typically, these protocols suggest how many weeks a student should remain in a tier and when the referral for special education assessment might begin. Like obedient soldiers, site educators take their RTI marching orders and begin to complete the items on their RTI to-do list, such as administering a universal screening assessment, regrouping kids in tiered groups, or creating an intervention period. This approach is fraught with potential pitfalls. 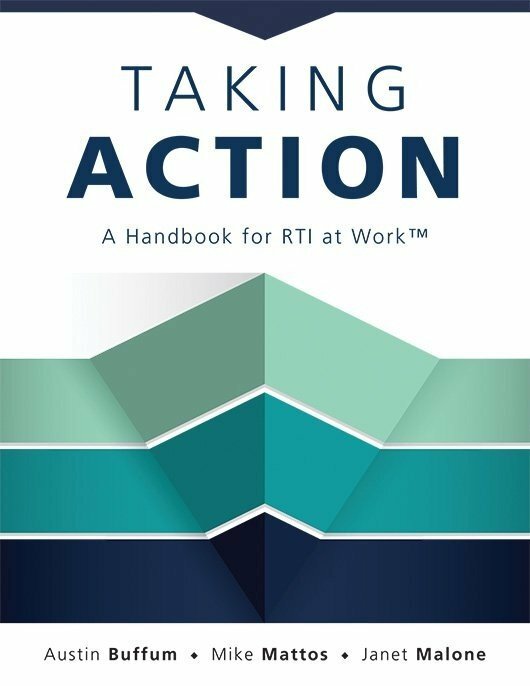 It reduces RTI to a list of disconnected tasks to cross off, rather than a set of ongoing processes to improve teaching and learning. The specific things we ask educators to do in response to intervention are not ends in themselves, however, but means to an end. For example, a school’s goal should not be to administer a universal screening assessment in reading, but rather to ensure that all students are able to read proficiently. To achieve that goal, it is essential to start by measuring each student’s current reading level, thus collecting vital information needed to identify at-risk students and differentiate initial instruction. Universal screening is a means to help achieve the end of student learning. It is not necessary for district leadership to make a choice between structural and cultural change; both are absolutely necessary. But in many districts, efforts to uniformly implement RTI place a greater emphasis on compliance with paperwork and protocols than on high levels of engagement and ownership among its teachers. RTI is as much a way of thinking as it is a way of doing; it is not a list of tasks to complete, but a dynamic value system of goals that must be embedded in all of the school’s ongoing procedures. This way of thinking places a higher priority on making a shared commitment to every student’s success than on merely implementing programs. How Do We Stay Legal? Because RTI was part of the reauthorization of the Individuals with Disabilities Education Improvement Act (IDEIA) in 2004, many schools view RTI implementation from the perspective of legal compliance. This concern is certainly understandable, as special education is one of the most litigious segments of public education, and the potential costs of being out of compliance or losing a fair hearing can be crippling to district resources. However, if this question is the first consideration when creating an RTI system, it leads to a number of unfortunate outcomes. For example, we find many districts creating unnecessarily complicated, time-intensive documentation processes for every level of student intervention out of fear that the data may be needed someday if a specific child is referred for special education identification. Teachers required to follow this Byzantine paper trail tell us that they often decide against recommending students for interventions because “it isn’t worth the paperwork.” Other teachers complain that they hate RTI because they spend more time filling out forms than actually working with at-risk students. Additionally, we have worked with districts that refuse to begin implementing RTI until there is a greater depth of legal interpretation and case precedent—meanwhile, their traditional special education services continue to achieve woefully insufficient results in student learning. Nationally, the special education redesignation rate (the percentage of students who are officially deemed no longer in need of special education services) is 4 percent (USDOE, 1996a). According to the U.S. Department of Education, the graduation rate of kids with special needs is 57 percent (USDOE, 2001). Up to an estimated 50 percent of the U.S. prison population was identified as having special needs in school (NCSET, 2006). By almost any measure, there is no evidence to suggest that greater levels of legal compliance lead to greater levels of learning. So while staying legal is a necessary consideration, the first question we should pose is not how do we stay legal, but rather, how do we help this child be successful? When their children succeed in school, parents rarely file for fair hearing. What Is Wrong With This Student? This has been the first question of our special education system for nearly a halfcentury. At most schools, when a student consistently struggles in the general education program, the school’s systematic response is to refer that student for special education testing. As special education expert David Prasse (2009) states, traditionally schools have believed that “failure to succeed in a general education program meant the student must, therefore, have a disability.” Does special education testing assess the effectiveness and quality of the teaching that the child has received? Rarely, if ever; instead, the entire focus is on discovering potential avenues by which a student might become qualified to receive special education services. Response to intervention is built on a polar-opposite philosophy from traditional special education. When a student struggles, rather than assume there is something wrong with the student, we first assume that we are not teaching the child correctly. We turn our attention inward to ask how we can find better ways to meet this child’s specific learning needs. Unless a school is able to move beyond asking, “What is wrong with this student?” it is unlikely that school will ever see RTI as anything more than a new way to identify students for special education. If a school begins with the mindset that RTI is a means of raising test scores, implementing mandates, staying legal, and/or identifying kids for special education, then those outcomes will guide staff thinking throughout the process. In turn, these misguided principles will often lead to misguided actions. The purpose of RTI is to ensure high levels of learning for every child, and our actions must be guided by that purpose. If the previous questions are the wrong questions to guide our thinking and actions, then what are the right questions to lead our work? As Judith Bardwick recommends, “the most important question in any organization has to be ‘what is the business of our business?’ Answering this question is the first step in setting priorities” (Bardwick, 1996, p. 134). If this is the case, educators must begin by asking, why are we here? Our schools were built neither to give educators a place to teach nor to give government officials locations to administer high-stakes standardized tests each spring. If we peel away the various layers of local, state, and federal mandates piled on schools, the core mission of any school system is to provide students with the skills and knowledge they will need to be self-sufficient, successful adults. As educators, we should provide every student the type of education we would want for our own child. Ask parents what they want school to provide, and it is doubtful they’d answer, “I just want my child to score proficient on state assessments,” or “I want my child to master standard 2.2.3 this year.” As parents, we see the bigger picture. Learning specific academic standards and passing state tests are meaningless if the child does not ultimately become an intelligent, responsible adult who possesses the knowledge and quality of character to live a rewarding adult life. What Knowledge and Skills Will Our Children Need to Be Successful Adults? If the fundamental purpose of school is to prepare our children to be successful adults and citizens, this is logically the next question we should ask. To be sure, the world for which we are preparing our students today is not the world most educators entered when we transitioned from childhood to adulthood. During the 20th century, the United States became the most powerful economic force on earth based on an economy driven by industry and agriculture. One hundred years ago, almost half of America’s adult population farmed for a living, while another third worked in factories (Hagenbaugh, 2002; U.S. Department of Agriculture, Utah State University Extension, & LetterPress Software, n.d.). These honorable, labor-intensive professions did not require a high school diploma or college degree, yet provided sufficient wages and benefits for most Americans to maintain a middle-class standard of living. Today, less than 1 percent of our population directly farms for a living, and less than 10 percent works in factories (Hagenbaugh, 2002; U.S. Department of Agriculture et al., n.d.). Our new economy is driven by technology, innovation, and service. Because technology and human knowledge are changing at faster and faster rates, educator Karl Fisch (n.d.) states: “We are currently preparing students for jobs that don’t yet exist, using technologies that haven’t been invented, in order to solve problems we don’t even know are problems yet.” Due to this acceleration of human knowledge, Alvin Toffler (Toffler & Toffler, 1999) says the definition of literacy in the 21st century will not center on whether a person can read and write, but rather on whether a person can learn, unlearn, and relearn. How do we prepare students for jobs that don’t exist? How do we teach our students knowledge that has not been discovered? Teaching comprehension and computation skills will not be enough; we need our students to be able to analyze, synthesize, evaluate, compare and contrast, manipulate, and apply information. Our state tests measure these skills inadequately at best. Think how low we are setting the bar for our students if our only goal is to get every child to be proficient on state assessments. If we truly focus our efforts on the higher-level thinking skills that our children need for their future, state tests will be downright easy for them. How Effectively Are We Preparing Students for These Future Challenges? The normal curve is not sacred. It describes the outcome of a random process. Since education is a purposeful activity in which we seek to have the students learn what we teach, the achievement distribution should be very different from the normal curve if our instruction is effective. In fact, our educational efforts may be said to be unsuccessful to the extent that student achievement is normally distributed. It is unrealistic to expect our traditional school system to ensure high levels of learning for every child with practices designed to have only a small percentage of students achieve at these levels. In fact, “the bell curve serves as both a model and a fitting symbol of an archaic public education system. It describes a broad swath of mediocrity flanked by a sliver of excellence and a ribbon of failure” (Wallace & Graves, 1995, p. 24). What Must We Do to Make Success the Reality for Every Child? Once we have embraced the belief that the fundamental purpose of our schools is to ensure that every student learns what he or she needs to know to become a successful adult, and we clearly understand the skills and knowledge that our students will need to be competitive in the world they will inherit, then our final question would be, what must we do to make this a reality for every child? While this question sounds daunting, the answer is within our grasp. There is tremendous evidence and consensus on what schools need to do to ensure that all kids succeed. As Ron Edmonds said more than thirty years ago: “We can, whenever and wherever we choose, successfully teach all children whose schooling is of interest to us. We already know more than we need to do that. Whether or not we do it must finally depend on how we feel about the fact that we haven’t so far” (Edmonds, 1979a, p. 23). It is a universally acknowledged truth in education that all children do not learn the same way. Because learning styles and instructional needs vary from student to student, we must provide each student targeted instruction—that is, teaching practices designed to meet the individual learning needs of each student. We also know that all children do not learn at the same speed. Toddlers do not learn to walk or talk at the same rate, nor do students learn to read, write, or solve equations at the same time. We know that some kids will need more time to learn. Each student is randomly assigned to a teacher for each grade (elementary level) and/or subject (secondary level). Each teacher is responsible for meeting all the learning needs of every student assigned to him or her. The teacher provides daily instruction, usually in a whole-group setting. Instruction is provided within a predetermined, finite amount of time, most often determined by the school’s master schedule. If the teacher’s instructional style and methods match a student’s learning style, and if the class period provides the student with enough time to learn, then the student will be successful. If either the teacher’s instructional style and methods or the time allotted do not meet an individual student’s learning needs, then the student will likely fail. Traditional school practices are in direct conflict with the formula for learning. The failure to differentiate instruction to meet the needs of individual students makes instruction a constant; likewise, finite amounts of time for all students to learn new material make time a constant. In the traditional formula for learning, if instruction and time are constants, only one remaining element can be variable—learning! As educators, we can’t be surprised that our schools are leaving kids behind. The traditional model ensures this outcome. It worked perfectly for preparing students to be adults in 1950, but we are no longer preparing kids for life in Mayberry; we are preparing them for life in the age of BlackBerry. If our new mission is to ensure high levels of learning for all students, learning must be the constant, while instruction and time must be varied to meet the needs of every student. That is the purpose of RTI: to systematically provide every child with the additional time and support needed to learn at high levels. While the underlying premise of the formula for learning is easy to understand, most schools find that putting this principle into daily practice is not nearly so simple, due to their overemphasis on raising test scores, compliance-driven decision making, one-size-fits-all directives, and implementation practices that are too burdensome for the site educators who actually do the work. We have carefully and purposefully designed this book to address these obstacles by focusing on two critical outcomes. First, we strongly believe that changing our schools must start by building a culture of commitment, empowerment, and site ownership. We create this culture when we find balance between (1) expecting schools to abandon outdated traditional school practices and implement the proven practices necessary to ensure that all students learn and (2) allowing schools the autonomy to tailor the implementation of these practices to meet the individual needs of their students, using the distinct talents and resources of their local sites. We must be “tight” about what schools must do to help all students learn and “loose” on how they carry out these concepts and practices (DuFour, DuFour, Eaker, & Many, 2006). This balance of responsibility and site ownership empowers schools. Second, we must adopt guiding principles and practices that are simple, practical, and doable. Our focus on these two vital outcomes has profoundly affected our rethinking and refining of our recommendations in this book. Nowhere is this more evident than in our efforts to simplify our thinking about RTI into four essential guiding principles. Collective responsibility. A shared belief that the primary responsibility of each member of the organization is to ensure high levels of learning for every child. Thinking is guided by the question, Why are we here? Concentrated instruction. A systematic process of identifying essential knowledge and skills that all students must master to learn at high levels, and determining the specific learning needs for each child to get there. Thinking is guided by the question, Where do we need to go? Convergent assessment. An ongoing process of collectively analyzing targeted evidence to determine the specific learning needs of each child and the effectiveness of the instruction the child receives in meeting these needs. Thinking is guided by the question, Where are we now? Certain access. A systematic process that guarantees every student will receive the time and support needed to learn at high levels. Thinking is guided by the question, How do we get every child there? We contend that these four Cs are the essential guiding principles of RTI. Consider for a moment the meaning of the word essential. When something is essential, it is absolutely indispensable, so important to the whole that the whole cannot survive without it. Without each of the four Cs, it is impossible for a school to achieve high levels of learning for every child. The four Cs work interdependently to create the systems, structures, and processes needed to provide every child with additional time and support. All other practices and specific recommendations flow from these four essential guiding principles, as we’ll explore in the rest of the book. 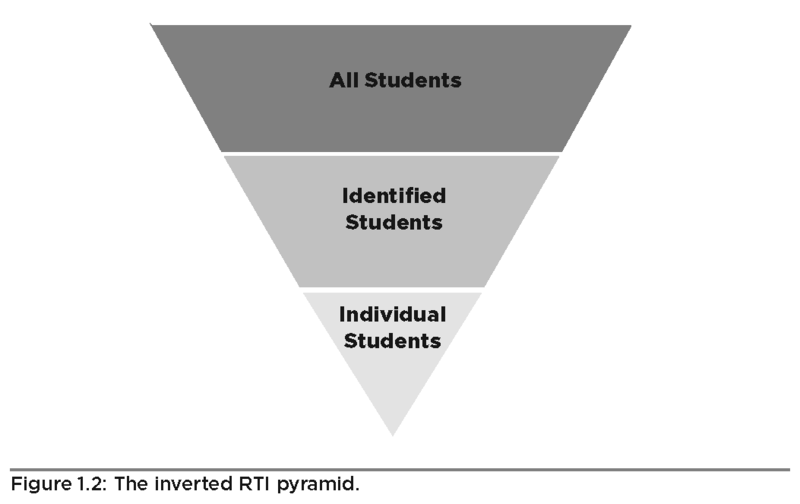 In thinking of RTI, the most common image that comes to mind is the RTI pyramid. 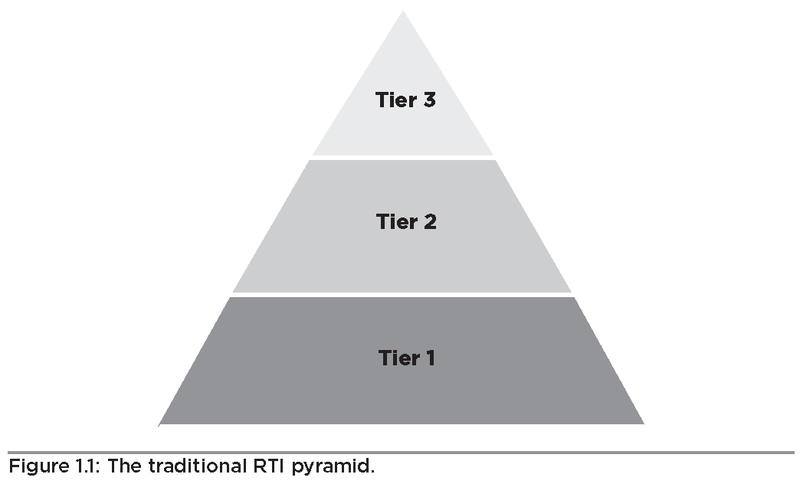 Figure 1.1: The traditional RTI pyramid. Working with schools throughout North America, we have found that this graphic has been both a blessing and a curse. When used properly, it is both a powerful visual representation of the RTI process and a useful structure to assist in organizing a school’s core instruction and support resources. The pyramid shape is wide at the bottom to represent the basic instruction that all students receive. As students demonstrate the need for additional support, they move up the pyramid, receiving increasingly more targeted and intensive help. Fewer students should need the services offered at the upper levels, thus creating the tapered shape of a pyramid. The pyramid is also traditionally separated into tiers, with Tier 1 representing grade-level core instruction, Tier 2 supplemental interventions, and Tier 3 intensive student support. When used as a visual model to capture these guiding ideas, the pyramid has proven to be a helpful tool for schools implementing RTI. Unfortunately, far too often we have seen schools and districts misinterpret and misapply the pyramid structure. Rather than create an intervention system that is fluid, flexible, and sensitive to the needs of each child, schools and districts implement the pyramid as a rigid, protocol-driven program. Student identification, placement, and duration in each tier are predetermined based upon screening assessments, cut scores, and program decision protocols. Often, the upper tiers are disjointed and misaligned to the school’s core instruction. School resources and responsibilities are frequently divided, with Tiers 1 and 2 designated for general education and Tier 3 for special education. Considering these concerns, we have carefully re-examined the RTI pyramid. We still believe there is tremendous power in using a pyramid as a visual representation of the way in which we should think about RTI, but we believe a more accurate way to capture the right thinking is by inverting the pyramid, as in figure 1.2. Figure 1.2: The inverted RTI pyramid. If we consider the formula for learning, we know we must focus our efforts on the unique needs of each child. The inverted pyramid continually focuses a school’s collective attention and resources to a single point: the individual child. We still believe that the pyramid should be wide at the top to represent access to the core grade-level curriculum that all students deserve and need. We also strongly support the RTI belief that a school’s initial core instruction must be designed to meet the needs of most students and should include differentiation. Beyond this initial instruction, when some students demonstrate the need for more targeted instruction and additional time, the school responds by focusing on the needs of each of these students. In addition to making the pyramid too rigid and focused on special education identification, schools consistently make another damaging misinterpretation and application of the traditional RTI pyramid. Too often, the process of creating a schoolwide system of interventions has reinforced a belief in general education teachers that they are responsible for only the initial teaching in Tier 1. If students require help after initial teaching, the classroom teacher’s response is, who do I send them to? 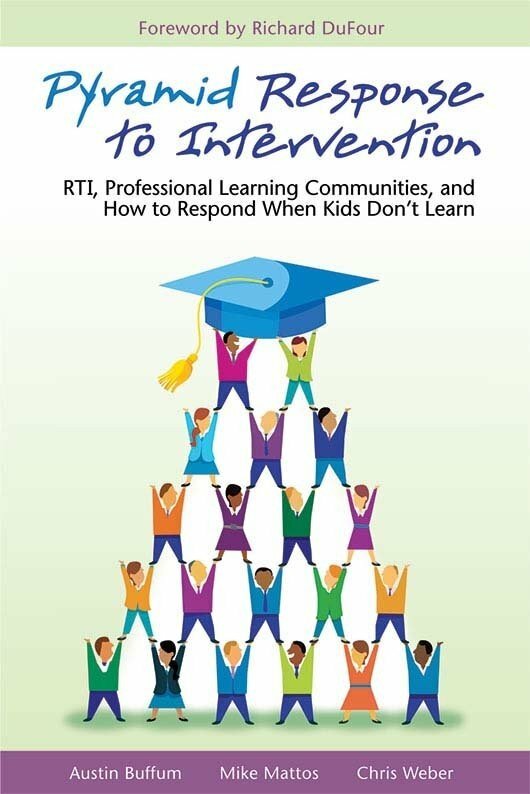 Especially at schools with a large number of at-risk students, this practice overwhelms the intervention team, site intervention resources, and the RTI process. In response to this problem, many districts have responded by dictating that classroom teachers cannot refer a student for schoolwide interventions until they can document a set of predetermined interventions that must first be tried in their classroom. This approach places the initial response of Tier 2 interventions with the classroom teacher. The problem with this approach is that every student does not struggle for the same reason. The reasons can vary from just needing a little extra practice on a new concept, to lacking necessary prerequisite skills, to requiring assistance with English language, to severe attendance and behavioral issues. It is unlikely that each teacher has all the skills and time needed to effectively meet every need—making initial Tier 2 response an impossible responsibility for classroom teachers. This approach fails students and educators. The answer to the dilemma of how to best meet the child’s needs, given limited resources, lies not in determining who is responsible for intervening when students don’t learn—classroom teachers or the school’s intervention resources—but in determining the responsibilities of these specific groups to ensure that all students succeed. 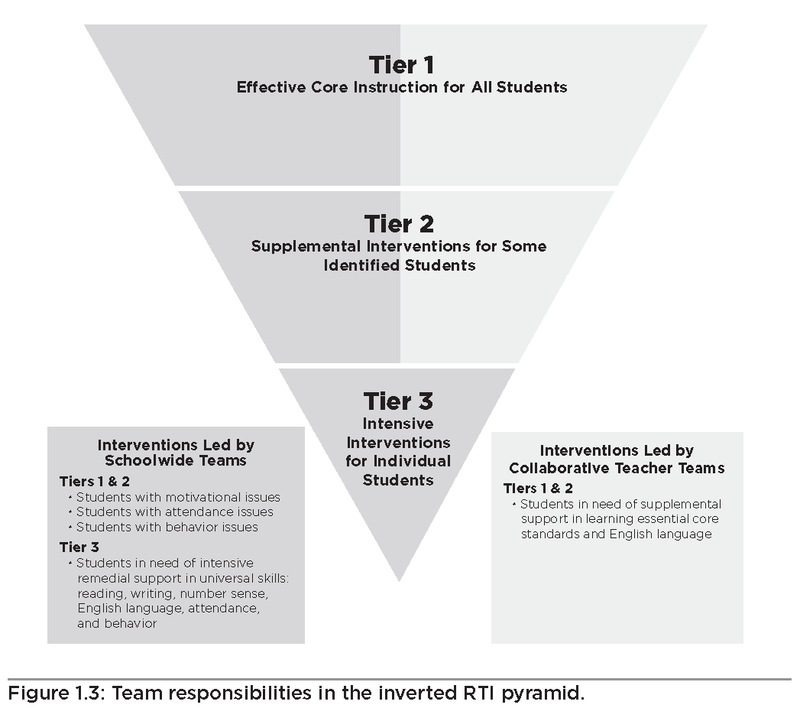 To visually capture this thinking, we have divided the RTI pyramid into two distinct areas of responsibility: interventions led by collaborative teacher teams and interventions led by schoolwide teams (fig. 1.3). Collaborative teacher teams are teams of educators whose classes share essential student learning outcomes; these teachers work collaboratively to ensure that their students master these critical standards. The structure for teacher teams could include grade-level, subject/course-specific, vertical, and/or interdisciplinary teams. While teacher teams focus on specific grade/subject learning outcomes, we recommend that two schoolwide collaborative teams—a site leadership team and an intervention team—be responsible for coordinating core instruction and interventions across the school. Specifically, we will make the case that a school leadership team should be responsible for building consensus on the school’s mission of collective responsibility for student learning, coordinating individual and team efforts across the school to meet this goal, and allocating the school’s limited resources to best support high levels of learning for all students. While this leadership team is responsible for the larger schoolwide structures that support student learning, the school intervention team’s primary responsibility is to coordinate the school’s efforts to meet the needs of individual students requiring intensive support. The structures, roles, and responsibilities of both teacher and schoolwide teams will be thoroughly explored throughout this book. Providing greater clarity on exactly how to share responsibility for student learning will make RTI simpler, more focused, and more doable for educators—and more effective for children. The RTI pyramid is more than a visual representation of a system of interventions; it is a practical tool that will help transform thinking into action. It has the flexibility to help both district leadership plan for systemwide interventions and grade-level teams plan to teach specific standards. Throughout the book, we will use this collaborative vision to frame content, connect ideas, and lead schools to achievable outcomes. Figure 1.3: Team responsibilities in the inverted RTI pyramid. In his book Good to Great, Jim Collins says that great organizations “maintain unwavering faith that you can and will prevail in the end, regardless of the difficulties, and, at the same time have the discipline to confront the most brutal facts about your current reality, whatever they may be” (Collins, 2005, p. 13). We have shared the brutal facts of our traditional educational system’s ability to prepare our students for the new realities they will face as adults. Now that we understand our current reality, know our destination, and have defined our path to get there, let us begin the journey.